Are Parents Liable for Their Babies’ Prenatally Acquired Injuries? Ashley John Moyse. New York: Palgrave Macmillan, 2015. Reviewed by Jacob Schatzer, PhD, who is assistant professor of biblical and theological studies at Palm Beach Atlantic University in West Palm Beach, Florida, USA. John P. Lizza, Editor. Baltimore: Johns Hopkins University Press, 2014. 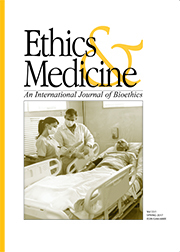 Reviewed by Michael G. Munoz, D.Bioethics, MA(Bioethics), MAR, MEd, who worked in fire fighting for over 30 years, is adjunct faculty at Grand Canyon University in Phoenix, AZ, and served on the Ethics committee at Phoenix Children’s Hospital before relocating to Spokane, WA, USA. Steven M. Hacker, Charleston, SC. Nano Press, LLC, 2016. Reviewed by Robert E. Cranston, MD< MA, FAAN, who is an associate clinical professor (Neorology) at University of Illinois college of Medicine, a hospital ethicist at Carle Foundation Hospital in Urbana-Champaign, and medical director for talent development and learning at Carle Clinic in Urbana, Illinois, USA.